When feeding birds, you may find that predators such as hawks or cats notice the birds. Hawks are common, found in all habitats, both in town and in the country. Below are some tips on helping keep your feeder birds safe. 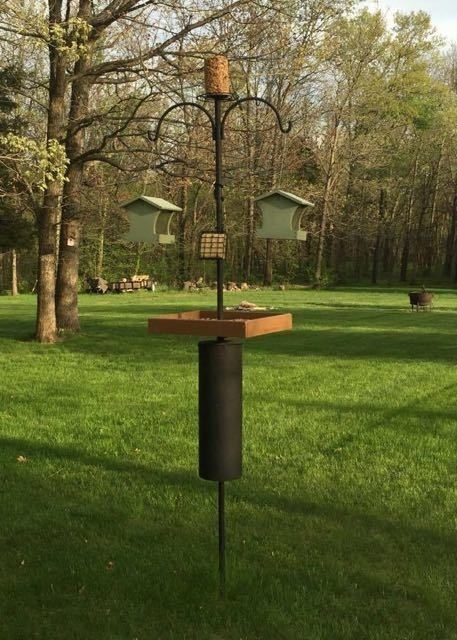 • Since predators often ambush from hidden cover, keep feeders on a pole (such as our Advanced Pole System) in the open, about 10-15 feet from bushes and trees. This allows birds to watch for predators from a distance, giving them time to escape. Even if a hawk or cat is foolish enough to sit right out in the open, most birds will be able to see them and dive into cover. • If a hawk does manage to make a catch, avoid the temptation to chase it away. This will not undo what has been done, but will force the hawk to hunt again sooner than it might otherwise. Simply close the blinds and avoid the scene. • The above tips will help minimize losses. Some hawks will still manage to hunt, but primarily on the birds that are in lesser condition. As the other birds get wise and hunting gets harder, most hawks will not stay in one particular spot for terribly long before moving on to new grounds. At that point, the feeder birds will return. 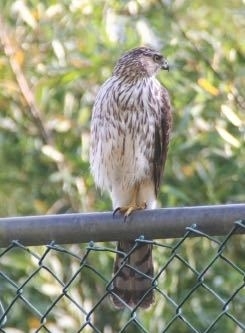 • Remember, while hawks might be annoying at feeders, they are federally protected species and you cannot harass them. Simply take steps to make your yard a less successful place to hunt. • Since cats are one of the top preventable causes of songbird decline, we encourage people to keep their cats indoors, or allow them out only under supervision on harness and leash or into a "cat patio" type screened enclosure. We built one for our shop cats and they love it. If it's a neighbor cat causing issues, you might try politely speaking with the owner as many people don't realize their pets are roaming out of their own yards and causing havoc elsewhere. • At WBU, we stock a non-toxic cat repellent that can be sprinkled under the trees and bushes where the cats hide. It has a smell the cats don't like, urging them to move along. • A ring of decorative 2-3' high garden fencing, making a 10-12' circle around the feeding area can slow cats down. It's not that a cat can't jump the fence, but doing so throws off their stealth. • Serving only foods that do not fall to the ground (particularly WBU Seed Cylinders - compressed logs of seeds and nuts) or using feeders with large catch trays with selective foods means the birds won't be gathering on the ground where they are easier targets for cats. Stop by and we can show you which foods are best to offer. Feeders placed away from ambush sites and using the right food/feeder combinations can reduce predation issues. 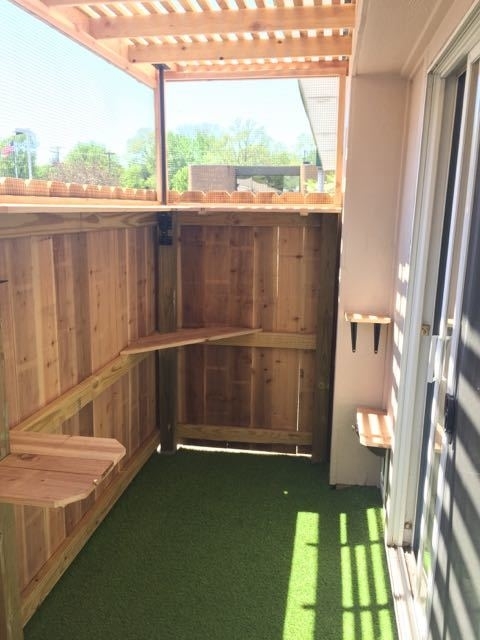 A screened cat patio, like the one we built for our shop cats, gives cats a safe place to get some fresh air and sunshine, while keeping them and the birds safe.